A recent storm near New Zealand is being blamed for major waves thousands of miles away off the coast of California this week. 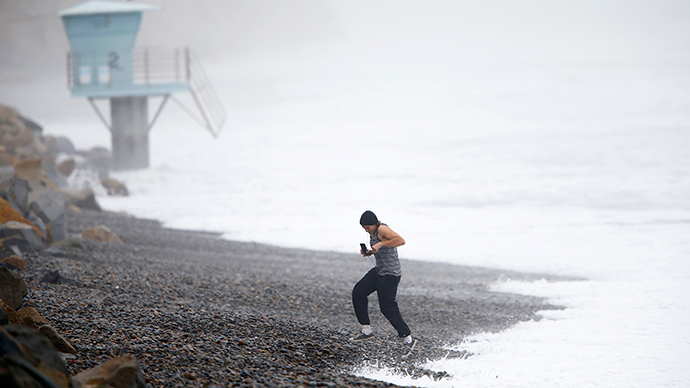 The National Weather Service says Californians can expect to encounter massive waves through Tuesday this week as a result of the storm that erupted on Thursday and Friday in the southern hemisphere, the Los Angeles Times reported. According to the paper, a high-surf advisory has been issued for the west coast upon concerns that waves as tall as 15 feet could crash onto Newport Beach in Orange County. The Orange County Register reported on Monday morning that waves taller than 18 feet have already been spotted at the Wedge, a popular surf spot by Newport Beach. “Right now, if a surfer came down here, I’d be like, ‘Dude, what are you doing?’” lifeguard Jonathan Richards told the paper eight miles up the beach in Huntington on Sunday. According to the Associated Press, authorities had to rescue at least 16 people in Newport Beach on Sunday due to high waves. Additionally, the Carnival Imagination cruise ship was prompted to change course and dock in San Diego due to the extreme conditions. "Therefore, in the interest of caution, the cruise ship ... deviated to San Diego," Carnival said in a statement. The LA Daily News reported that current swells have been racing across the Pacific from New Zealand at a rate of around 30 miles per hour, according to NASA oceanographer Bill Patzert, covering upwards of 750 miles each day. “This will carve a new coastline in some areas,” Patzert predicted.